Silverstein Properties Chairman Larry Silverstein announced that the company has signed a lease with Zurich American Insurance Company, the leading multi-line insurance provider, for 132,000 square feet of office space at 4 World Trade Center. Zurich, which is currently located at One Liberty Plaza, will move its New York headquarters to the 52nd, 53rd and 54th floors of the Fumihiko Maki-designed building in summer 2017. Zurich Insurance Group is a global leader in managing risk. Its global headquarters is based in Zurich, Switzerland. The insurer employs about 55,000 people worldwide serving customers in more than 170 countries and territories. Zurich has been helping American businesses understand and protect themselves from risk for more than 100 years. The company has helped shape the America known today by insuring iconic infrastructure projects such as the Hoover Dam and Madison Square Garden. Jeremy Moss, Director of World Trade Center Leasing for Silverstein Properties, led the negotiations for the landlord, together with the CBRE agency team including Mary Ann Tighe, Steven Siegel, Adam Foster, Steve Eynon, Evan Haskell, Robert Hill and David Caperna. Zurich was represented by Martin Horner and Robert Romano of JLL. According to Jeremy Moss, the Zurich lease at 4 World Trade Center is the largest private sector relocation Downtown in 2016. 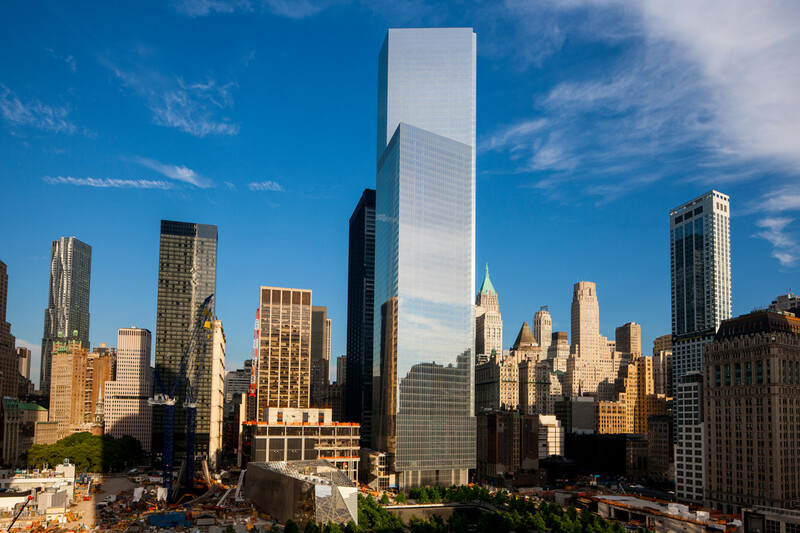 The first tower to be completed on the 16-acre site, 4 WTC was designed by Pritzker-prize winning architect Fumihiko Maki to meet a LEED Gold standard of sustainability. A model of transparency and efficiency, the 977 foot (298 meter) tower contains 2.3 million sf (213,680 sm) of light-filled, green and high-tech office space spread over 56 office floors.